When as Rhys, do as the Rhys's do. You decide to try chatting up the WITCH. Talking with FEMALES is... not easy for you... but if you're going to pull off this CHARADE and make some progress then you'd better just go for it! 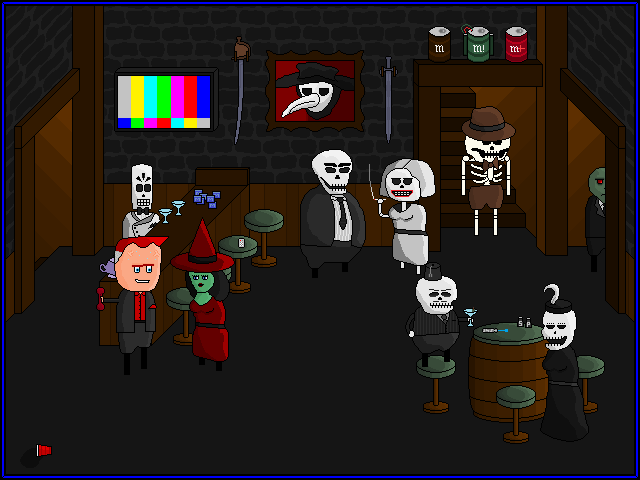 Seeing your approach, MANUEL (the smooth bartender) disengages from the WITCH and slips back behind the BAR. You... smile at the WITCH. Awkwardly. WP (Witch Person): Hi! I haven't seen you around here before. How are you doing? WP: Oh, well, good to meet you, Alan. I'm Patience. New here? ALAN: Um... what's your name? You're sweating now. How does Rhys do this? You might have a better brain, but when it comes to charm, he's a real piece of work. For once, you wish you had Rhys's pieces. Aw, Alan, sweetie, it's not that hard. She's a person, you're a person, and people talk. That's all. Whether you're up to trusting a witch or not, chances of survival improve if we have a guide. All in a rush, then: "Thanks, Patience. Yes, I'm new here, and you seem knowledgeable. Will you show me round, please?" And pray you don't roll a natural one on charm, or you're on your own. Oh. We're picking her up? Here I was, going for "talk to everyone." Compliment her eyes, tell her she has a pretty name, or say that the dress looks nice on her. So Alan has no skills in charm or guile-slinging. He'll have to stick with honesty and overwhelming smarts as much as possible. Will tongue-tiedness be a problem if Alan ends up having to deal with Jet on a continuous basis?